Tender Cuban-style shredded beef stewed in a pepper tomato sauce. With slow cooker and pressure cooker instructions, you can make this delicious recipe in either your crock pot or Instant Pot! 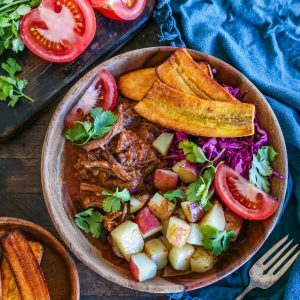 To celebrate the release of my new cookbook, Paleo Power Bowls, I thought I would share one of my favorite recipes from the book – Slow Cooker Ropa Vieja. Not only is this recipe one of my personal favorites, but it was a hit in my household, and among my recipe testers. Rest assured, this recipe has been tested probably over a dozen times, so you know it’s a keeper! 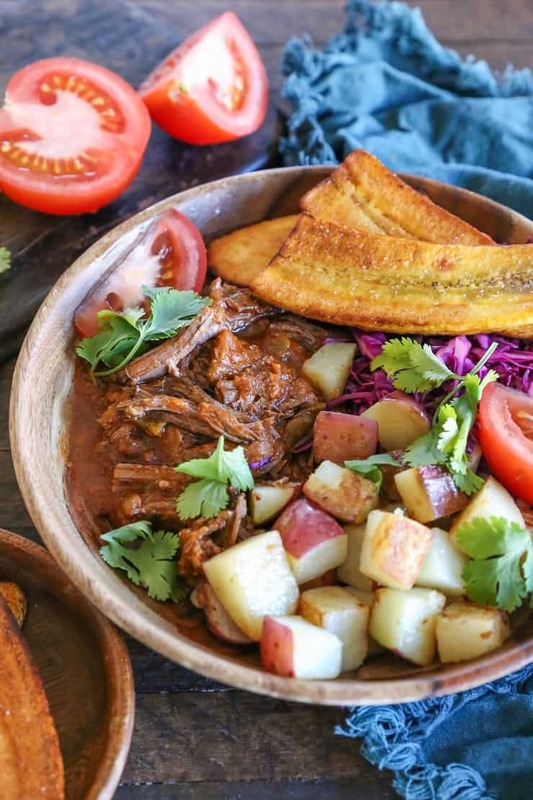 What is Ropa Vieja? 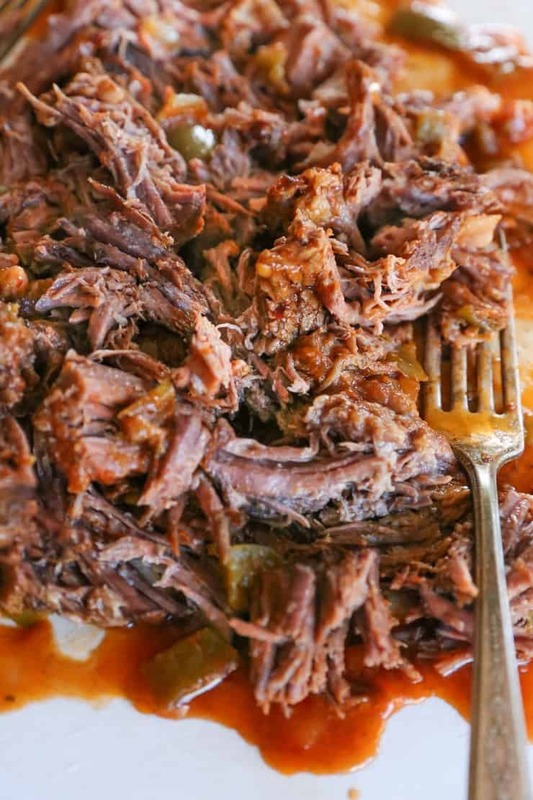 Simply put, it’s a slow cooked Cuban-style shredded beef made with green chilis, bell pepper, onion, tomato sauce, cumin, and oregano. This signature Cuban dish is also popular throughout the whole Caribbean. The result is tender, super flavorful shredded beef that requires hardly any effort to prepare! 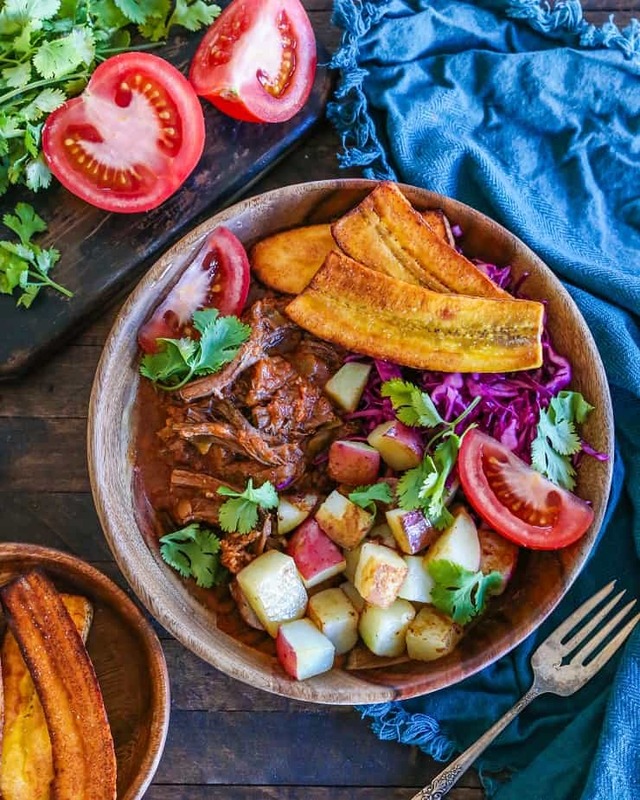 “Ropa Vieja” translates literally to “old clothes,” drawing a parallel between the vibrant shredded meat and tattered clothing. While I’ve never tried my palate at old clothing, I’m willing to bet this tastes far superior. Not long after finishing Paleo Power Bowls, I purchased an Instant Pot. After experiencing the full glory of this epic machine, I naturally wished I had made the purchase far sooner so that I could have included pressure cooker instructions along with slow cooker instructions. That said, I have included the pressure cooker instructions for this recipe as well so that you can make it either way. Serve this beef up with your choice of sides—the traditional side is white rice and black beans, if you can tolerate it. I personally love it with either rice or cabbage slaw (or both), fried plantains, and avocado. You can also get creative and use this to make tacos (using paleo tortillas) or Whole30 tacos (using lettuce cups). Leftovers make for amazing sandwiches! Toast up your favorite paleo (or gluten-free) sandwich bread for an excellent ropa vieja sammie. To make this low-FODMAP: omit the onion and garlic powder. Use either mild or hot green chilis depending on your preferred level of heat. When frying the plantains: replace avocado oil with any high-temperature cooking oil of choice. And for those of you who own a pressure cooker, here are the..
Stir together the ingredients for the sauce in a bowl or large measuring cup and set aside. Sprinkle the beef chuck roast with garlic powder and sea salt. Plug in your Instant Pot and turn on the Saute setting. Allow Instant Pot to heat up for 2 minutes. Add the avocado oil. Place the meat inside the Instant Pot and sear for 4 to 5 minutes, until the outside is deeply browned. Carefully flip the meat and sear the other side for 2 to 3 minutes. Pour the sauce over the beef. Secure the lid on the Instant Pot and set to the Pressure Cook setting on High. Cook 60 minutes with the steam release valve on “Sealing”. Once Instant Pot has finished its course, allow it to automatically go into the Keep Warm mode for an additional 30 minutes. Release any remaining pressure using the quick release valve. Turn off the Instant Pot and open the lid. Use tongs to transfer the beef to a cutting board and use two forks to shred it. Transfer the shredded beef back into the Instant Pot with the sauce and stir well so the meat absorbs the flavor of the sauce. From here, proceed with the rest of the recipe below to prepare the bowls! Check out Paleo Power Bowls for more recipes like this! 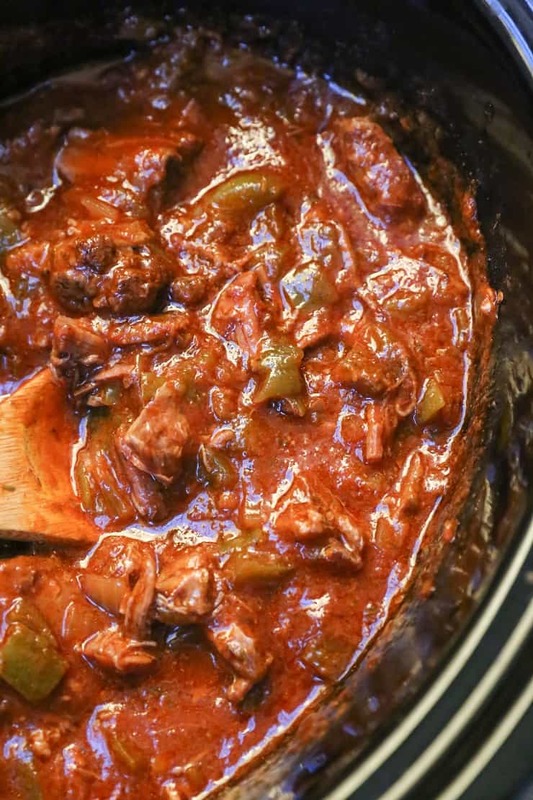 I hope this ropa vieja becomes a staple in your home, just as it is in mine! Add all ingredients for the sauce to a large (6-quart) slow cooker and stir well. Sprinkle the beef chuck roast with garlic powder and sea salt. Heat the oil to medium-high in a thick-bottomed stock pot or Dutch oven. Place the meat inside the hot stock pot and sear for 4 to 5 minutes, until the outside is deeply browned. Carefully flip the meat and sear the other side for 2 to 3 minutes. Note: you can use a cast iron skillet, but proceed with caution, as the fat from the beef will splatter out. Transfer the meat to the crock pot and nestle it in the sauce. Note: it’s fine if the meat isn’t fully submerged in sauce! Secure the lid on the slow cooker and set on the lowest setting. Cook 6 to 8 hours, flipping the meat halfway through, if possible, or until beef is very tender. Transfer the beef to a cutting board and use two forks to shred it. Transfer the shredded beef back into the crock pot with the sauce and stir well so the meat absorbs the flavor of the sauce. Preheat the oven to 400 degrees. Spread the potatoes on a large baking sheet and drizzle with 2 Tbsp avocado oil. Use your hands to toss everything together until potatoes are well-coated. Sprinkle with sea salt and place on the center rack of the preheated oven. Roast 20 minutes, stir the potatoes, then roast an additional 10 to 15 minutes, until golden-brown and cooked through. While the potatoes are roasting, fry the plantains. To do so, fill a small shallow skillet half-way up with avocado oil and heat over medium-high. Once the oil is all the way hot (you can test this by gently flicking a tiny amount of water on the oil to see if it sizzles), carefully place sliced plantains in the oil. Cook until golden-brown and crispy, about 2 to 3 minutes. Carefully flip and cook on the other side an additional 2 to 3 minutes, until plantains have reached desired level of crisp. Transfer to a paper towel–lined plate, sprinkle with sea salt, and repeat for remaining plantains. Place sliced red cabbage in a mixing bowl and add the lime juice. Firmly massage the lime juice into the red cabbage until it begins to soften, about 2 minutes. Sprinkle with sea salt to taste. Divide potatoes between 4 to 6 bowls and add desired amount of shredded beef and cabbage. Serve with fried plantains, tomatoes, and fresh cilantro. So does the pressure cooker build up pressure or does it vent the steam? I’m sorry, I don’t have an instant pot but I do have an electric pressure cooker. Thanks so much for your recipes. We have really enjoyed them. This reminds me of Barbacoa, which I have been making lately in my IP, just not as spicy. My copy of your new book arrived a couple of days ago. What a lovely cookbook!!! Hi there. I added all spices to the tee but found it really tomato-y as you said. Anything alternative?